App Previews have become increasingly important for app developers. On iOS, Apple has decided to put App Previews front and center for customers. When an App Preview exists, the video is the first thing they see. The App Preview is the most important part of your mobile strategy. Apple has lots of information online to make great App Previews. In this post I’d like to share our experience with you. The poster frame, that is the thumbnail picture you see before the video is playing, is not a separate picture. Apple does not allow you to upload a separate image, you have to pick a frame, video term for “picture”, from the App Preview for the thumbnail. This means that you should incorporate into the storyboard that there is a scene where that thumbnail picture is shown in a way that it’s easy for you to pick on upload. You also have to keep in mind that your audience needs to be able to see and digest that one picture fully. If it’s just flashing up, it’s confusing. It can be finicky to find just one frame. We recommend to lengthen the picture to about 1-2 seconds so that it’s easier to find and choose in iTunes Connect. Apple is open about what they want and don’t want to see. Essentially it boils down to this: show your app, nothing else. They don’t want to see particular hardware, they don’t want to see actors. Apple wants you to show your app, and nothing else. This means you are restricted to what your app does. Videos for games are much easier because they are entertaining enough on their own. Creating an entertaining and engaging cut from these apps is relatively easy. Classic apps are a little harder. You want to make sure that the storyboard aligns with your marketing and branding. Keep the video focused on what you want people to see. Keep in mind that folks don’t need to “get” your app, they don’t need to understand how the app works. An App Preview is not a mini tutorial that you can use to replace documentation. It needs to communicate why a potential customer should download your app. We’ve seen a common problem with App Previews: developers are not able to communicate what an app does and why it is useful to have the app. Check out our post on 6 of the Worst and Best iOS App Previews. App Previews can only be 30 seconds at most. We recommend to keep your video below it. From our experience certain apps, encoders, etc. have a slight variation how they count time. Sometimes one app says a video is 30 seconds, when another says it’s 30 seconds and 1 frame. If you keep your App Preview below the 30-second mark, you’re in the green. Apple doesn’t prohibit the usage of effects and overlays. We, therefore, recommend you make use of these techniques. With overlays that contain written text, the goal is to make it obvious what’s shown in the picture. It simply tells people what they should focus on. Overlays also make a video more accessible, e.g. for disabled people. The downside is that Apple allows one video only. One video for all languages. That makes it easy on the one hand, but also less accessible for folks around the globe. You can use a voice over to replace overlays, but then you lose the obviousness of an overlay. A simple, short text that just says it on the tin cap. The upside is that a voice over creates a more intimate feeling. Your audience hears a concrete human, not some abstract music that goes along with some text. From experience we can say that most clients settle for music and overlays. Though our preferred method is a voice over. 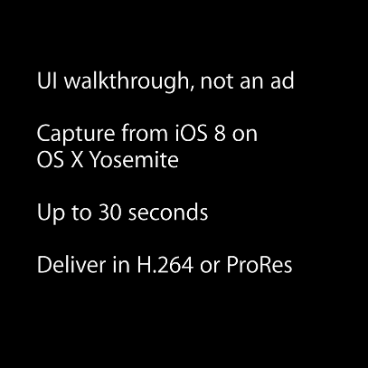 While certain Apple materials say that a video can be delivered in ProRes, Apple has removed this functionality and you are only able to upload videos in H.264 format. We have tried many things to comply with Apple’s encoding, but haven’t found out what Apple wants as encoding settings — they seem to be very strict about it. FFMpeg does not work out of the box, for example. We recommend you use the tools Apple tells you to use, and nothing else. Everything else has lead to rejections. If you want to add some extra fanciness to your thumbnail, design it in a way that it includes Apple’s play button. This button is shown above your App Preview and the thumbnail. We’ve seen developers incorporate a circle in their first screenshot (the thumbnail), which makes your app look different. Customers get the feeling you’ve spent that extra bit of thinking and work on that. We know how it is to work on an app. We’ve many friends in the app business and they consult us for questions about encoding, editing, and everything along those lines. If you feel in the need of help, drop us a line via mail, Twitter, or Facebook.